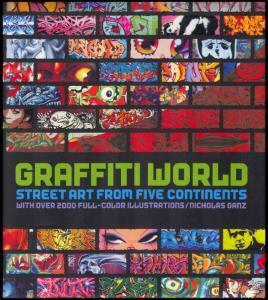 Graffiti World, one of my all time favs . Me being a graff enthusiast and always looking for new ideas this book opened up the world of graff like a brand new box of sneakers. One thing I love about this book is the fact that it’s like a trip around the world in only about 3 days. I also like the art style and pictures. And finally I really like the whole layout of the book itself. This book is like wham...it’s like a roller-coaster ride. I mean they take you from the Americas to Europe in like 100 pages. The smashing and crashing of how walls are destroyed in other countries fractionates me to the fullest, and being able to travel the world to see them all is so great...especially since I don’t have to leave my room. The explosion of art in this book is friggin overwhelming. I like opened the book and wham I was hit by a train of art. The art styles they had in other parts of the world were like really crazy...from wildstyle to doing different throw-ups and various tags. And every time I open this book I see something brand new...and well it’s awesome. The books layout is just really cool. I love how the pictures just flash out with color and they are all original. I even found some computer-programming artists that do their work on the computer. Take syndrome studios, an organization that makes graffiti on the computer. I looked them up and they also did some work with rap artist in making music videos. The research that went into this book was really extensive and well done. In conclusion all I have to say is that this book is the ish and I really enjoy it. The trip around the world in some amount of pages, to the crazy graffiti pictures that were taken. And the fact that this book gave me something outside of its pages was just great. All Copyrights reserved with Aditya Agarwal (Owner of Ingenious Art). Theme images by wibs24. Powered by Blogger.